Servitization is a logical step in the transformative journey of how companies work with customers and generate revenue. In the not-too-distant past, a manufacturing company likely focused on the sale of its products -- for example, a piece of construction equipment -- as a singular offering. Service contracts represented a cost to the company. When products failed, it was considered too expensive for a product-focused company to service its own equipment. Companies allowed third-parties to provide the service contracts and the manufacturing firms generated revenue solely from the products themselves. In the aftermath of the 2008 recession, companies needed new revenue streams in the wake of reduced spending -- and found them with service offerings. Even in an economic downturn, existing items needed to be fixed and new ones did not necessarily need to be bought. Today, one out of four manufacturing operations is generating new revenue from servitization, per Aberdeen Group research. Rolls-Royce is an example of a manufacturing firm that embraced a servitization model. The company wanted to improve aircraft performance, safety, and maintenance for its jet engines. It used an intelligent cloud and machine learning (in the form of Cortana) for three key outcomes: more efficient flight and maintenance plans, targeted and actionable fuel efficiency insights, and quickly generated reports and dashboards that tell compelling stories and deliver high-quality insights. When firms embrace a servitization model, they tend to expand their potential offerings. These companies can offer equipment-focused product life cycle offerings (including maintenance services), asset-focused managed services (more complex than a single piece of equipment, and often involving different pieces of equipment purchased at different points in time), and process-focused advisory services (consulting to other firms on how to migrate all the way to a servitized model). Servitization opens up all these potential offerings and revenue streams, and ultimately it is about delivering valued and differentiated business outcomes. These possibilities alone do not make the idea of servitization profitable, however. Companies still must minimize costs associated with servicing their products in the field. 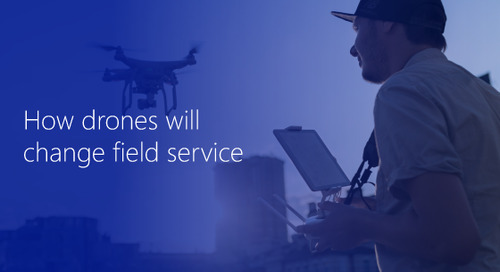 To learn more about paths to servitization, including the role of smart devices and field service management (FSM) software, as well as newer technology such as artificial intelligence and machine learning, download the eBook now. Oftentimes, a hot new business concept had its real beginning much earlier than anyone realizes. Take artificial intelligence as an example. The technology actually debuted at a conference at Dartmouth University in 1956. At the time, there was a lot of optimism. Some people at the conference believed robots and AI machines would be doing the work of humans by the mid-1970s. Of course, that did not happen -- what happened instead was that funding dried up and a period called “The AI Winter” began. That lasted into the late 2000s, when artificial intelligence again became a business and funding focus. Connected devices (the Internet of Things) are similar in this regard. There have been versions of machines communicating with one another since the early 1800s, and in 1982, graduate students at Carnegie Mellon connected a Coca-Cola machine to the Internet. The term was most likely coined in a 1999 presentation given at Proctor and Gamble. The presenter was linking RFID technology to P&G’s supply chain to the (new-ish, at the time) idea of the Internet. Connected devices were the first stage of IoT development: a race to connect as many devices as possible. Now we have entered the second stage. The new focus is on leveraging the data collected to make more intelligent business decisions. Take the example of Sandvik Coromant, a manufacturer of cutting tools and services for the metal-cutting industry. It sought to take its service-side business to the next level so the company developed a solution that connects to the Azure IoT cloud to collect data in real-time and get data out of the machining process such as temperature, load, and vibration. One of the concerns for executives in our current “Big Data” age has been that companies gather too much data, as opposed to the targeted data which would drive more effective decision-making. MIT has even suggested that one of the main jobs of the future will be a “data translator,” or an employee who helps senior leadership understand what the data is saying. In short: connecting to an IoT solution and receiving reams of data is not enough. The data needs to be tied to business insights and decision-making. Otherwise, you are just collecting information with no end goal in mind -- and that will limit productive applications of your overall data process. Servitization is the next generation of manufacturing revenue. While the idea has been around for years, the 2008 recession ushered it along even faster. Companies needed new revenue streams in the wake of reduced spending and found them with service offerings. Even in an economic downturn, existing items needed to be fixed and new ones did not necessarily need to be bought. Today, one out of four field service operations is generating new revenue from servitization, per Aberdeen Group research. When firms servitize, they tend to expand their potential offerings. Servitized companies can offer equipment-focused product life cycle offerings (including maintenance services), asset-focused managed services (more complex than a single piece of equipment, and often involving different pieces of equipment purchased at different points in time), and process-focused advisory services (consulting to other firms on how to migrate all the way to a servitized model). Servitization is rooted in better data leading to enhanced customer relationships. It is one step along the journey that manufacturing firms are taking to a servitization model. Augmented reality (AR), or the integration of digital information into a user’s real-time environment, is perhaps most notable in popular culture through Pokémon Go. In a business sense, it is seen in products like HoloLens. The capabilities of AR are transforming some legacy industries -- such as elevators. When most FSO leaders hear about a new technology, they want to understand how first-time fix rate will be impacted -- as this is often one of their key metrics. Augmented reality benefits first-time fix rate in a number of different ways. Workforce aging: The manufacturing workforce is aging, and perception is not always meeting reality in how the industry thinks about jobs. Conventional economic logic today tends to indicate that jobs do not exist, or are being automated rapidly. In reality, jobs do exist, but manufacturers often cannot find qualified candidates with the skills to fill them. Deloitte’s research with The Manufacturing Institute shows a need for 3.5M manufacturing jobs by 2025. Based on skills gap issues, 2M of these jobs will likely go unfilled. Additionally, many manufacturing companies are now being forced to recruit abroad, which is shifting the dynamics of their local economies. If a manufacturer were to embrace training delivered through augmented reality, for example, the flick of a technician’s head could immerse him or her into an entirely new world. Firms could then dispatch less-skilled technicians into the field while the more experienced engineers could stay at the main headquarters supervising and troubleshooting more difficult issues. First-time fix often drops because less-skilled technicians have to visit complex job sites. With augmented reality, those less-skilled technicians would have mentors to guide them. More effective training and practice: Consider combining two new technologies here. If an FSO had a service level agreement on a wind turbine, the company could send a drone to observe the turbine from above. The drone could record high-quality images and video. Because the drone is tied to a cloud server, this data could be sent back to the FSO in real-time. The FSO could then create an augmented reality of the turbine problem for the technician to practice on before visiting the client site. The technician would know exactly how to proceed when arriving at the client site and make sure his or her truck was ready to roll with all necessary parts. This all leads to increased first-time fix rate. Better priority management: Augmented reality is one of a host of technologies that allow for better priority management. Priority alignment often is not great in organizations -- tasks can be unclear or overlapping. By increasing effective use of time and information, the back office and technicians can focus on customer need, which drives up first-time fix rate. One major step for manufacturers on the path to servitization is embracing the power of these new technologies such as augmented reality. To learn more about that journey, including examples of companies that have morphed from more traditional manufacturing models into digitally driven ones, download the ebook, 5 Steps to Successful Servitization.